In the early 20th century, novel percussion instruments were commonly used in different forms of entertainment. Instrument manufacturing companies, such as the Leedy Drum Co, were experimenting with different designs of xylophones and marimbas. One of these experimental designs included the steel marimba, which led to the invention of the vibraphone around 1921. 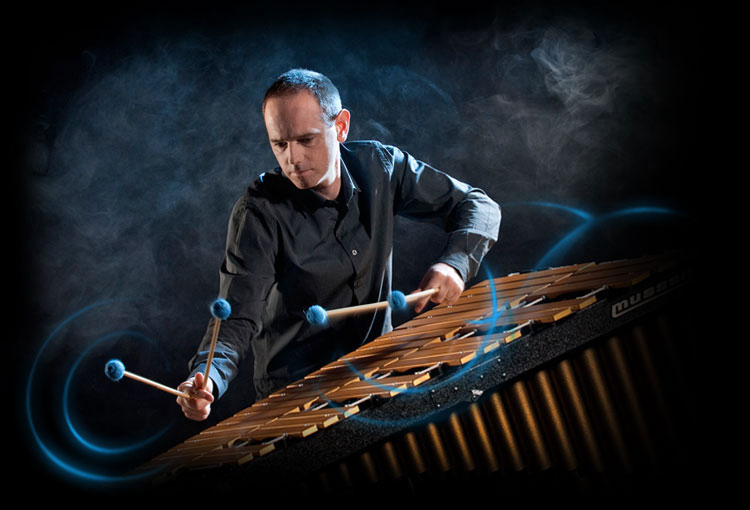 The vibraphone is akin to a marimba or xylophone, but is constructed with metal bars and a pedal to control sustain. The bars are arranged in a similar fashion to those of a piano, but the range is usually just three octaves (f –f`111). The instrument has the capacity to achieve a vibrato effect created by circular discs revolving in the resonators and operated by a motor mechanism. The vibraphone is still a relatively young instrument. It has enjoyed great popularity in the jazz genre since the early 1930s. Performers including Red Norva, Milt Jackson and Gary Burton have become champions of the instrument, each contributing to its growth and popularity in different ways. The vibraphone’s use in the classical genre is currently undergoing an exciting period of evolution.